Tanya Fischer shows off some of the “teeth” available for purchase during the Tooth Fairy Fundraiser. Submitted. 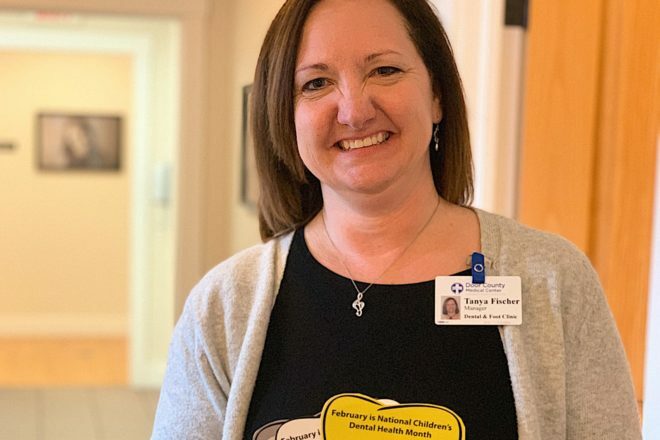 February is National Children’s Dental Health Month – and time for the Door County Medical Center (DCMC) Dental Clinic’s annual Tooth Fairy Fundraiser. The clinic provides oral-health care to children and adults from Door and Kewaunee Counties. The fundraiser runs Feb. 4 to 8, 11:30 am – 1 pm, at DCMC’s Sturgeon Bay campus, where volunteers and “tooth fairies” promote giving during lunchtime each day, and donors show support by purchasing a white, silver or gold “tooth.” The sale will remain open throughout the month, and donors may also contribute at any DCMC clinic. For more information, contact Tanya Fischer at 920.746.3516. To schedule a Dental Clinic appointment, call 920.746.3788.